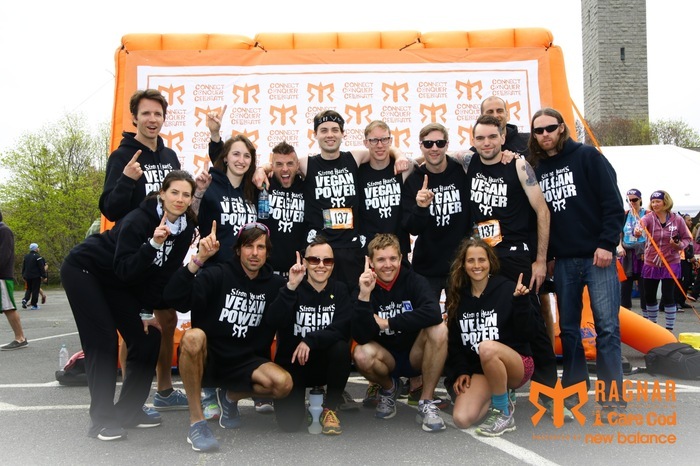 Ragnar Cape Cod – May 8th and 9th 2015. What an experience! You would think that being stuck in a van with 6 other people for so many hours without sleep would feel like a never-ending endeavor. It never is. It always flies by in a flash and once we all part ways to go back to our everyday lives we wonder why it had to come to an end so soon. We wish we could be back in that van – in desperate need of a shower, a wholesome hot meal, our beds… just because the experience is so positive, motivating and downright fun. Some of us show up to this event as absolute strangers but we leave as close friends. 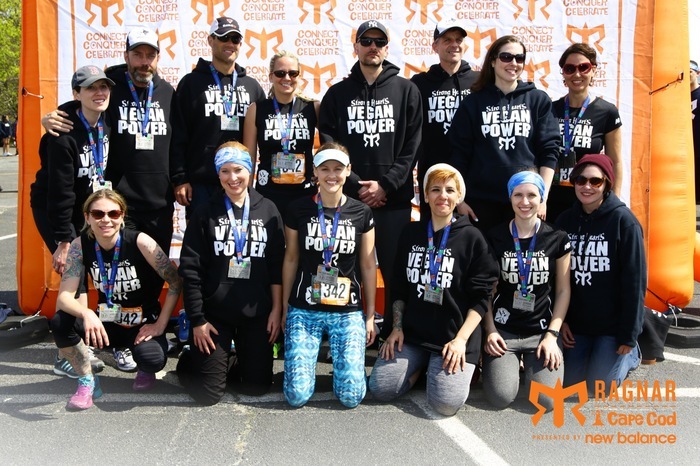 We’ve shared a powerful experience and although we may all come from different backgrounds we share 2 common passions – running and promoting ethical veganism to both our supporters and the naysayers. And I’d say we do a damn good job at both! We wanted to take over the Cape and we succeeded! There were plenty of comments about how we were everywhere. “How many of you are there?” Our shirts are bold, our attitudes positive and our message clear – anything you can do we can do vegan! B Team – Top Row from left: Peter Guarino, Jonny Hero, Scott Barras, Jonathan Auyer, Skott Daltonic, Jason Young, Martin Rowe. Middle Row from left: Laura Ryan, Kaitlin Long, Dana Portnoy, Meghann Wilson. Bottom Row from left: Sheila Bailey, Becca Wellner, Stephanie Crumley. C Team – Top Row from left: Laura Gardner, Michael Harren, Scott Henderson, Julie Henderson, Joel Capolongo, Peter Nussbaum, Kendra Murphy, Kate Paice-Froio. Bottom Row from left: Summer Keown, Carrie Hineline, Alicia Ford, Jasmin Singer, Melissa Centoni, Molly Wason. What about the running? Well, I barely remember that part 😉 A whole lot of work was put into making this event happen, and I’ve never been so exhausted before the Ragnar even started! 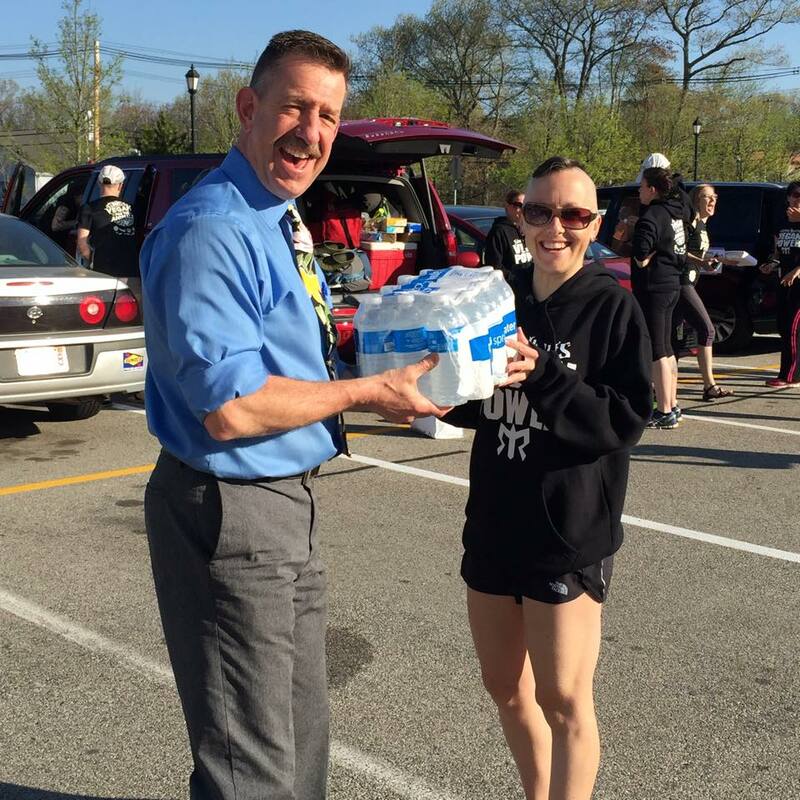 Once we all converged at the Whole Foods in Hingham, MA – the chaos began! Organizing 42 people, tons of food, race gear, binders, etc. into 6 assigned vans was quite the task. It basically looked like a party erupted in that parking lot before the store even opened, and it wasn’t long before the manager of Whole Foods came outside to check it out. He was super-cool and supportive of our efforts, and minutes later emerged with a shopping cart full of cases of water to donate to our cause. We all made it to the start line with just enough time to get C Team ready for the first start, and our awesome team photo (in the sponsor picture above). One by one each of our 3 teams set off to run 192 miles from Hull to Provincetown, MA. We would only see each other again for a brief time at one of the major exchanges when we all caught up to one another. 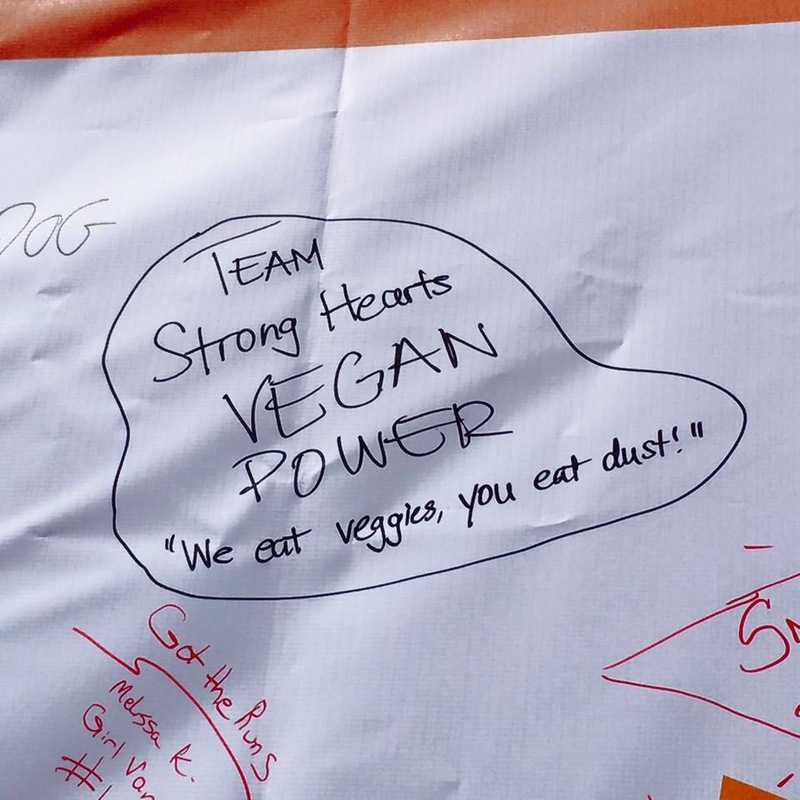 We placed our mark on the Ragnar Wall before heading out to our meet-up spot to celebrate and hand out awards. It’s difficult to sum up how awesome this opportunity is for us. We all see the tide turning as more and more people are not only accepting, but praising and seeking information about veganism. One of the greatest things we do at Ragnar (beyond our awesome running) is talk to people. Runners, volunteers, even residents of the towns we pass through see our shirts, our smiling faces, and the fun that we are having. We are often approached by people who want to know more – they want to learn about our cause, why we choose veganism, what we eat. All of our teammates are happy to share our experiences and that is what this is all about. 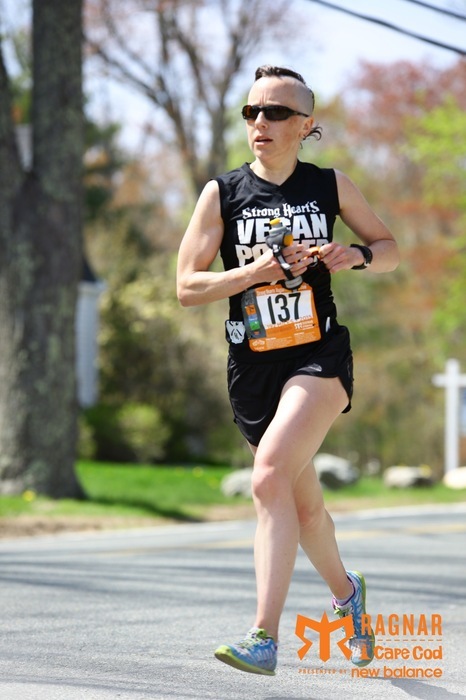 Other vegan runners are excited to see us – they come up and thank us for doing what we’re doing and ask how they can be a part of it. Oh how I love this team! 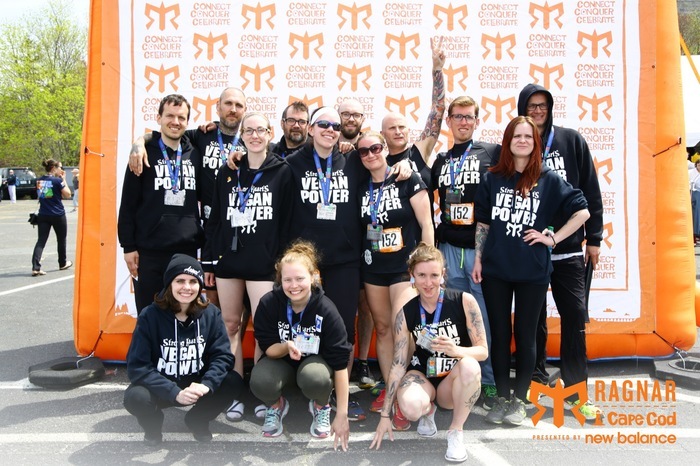 One last note – we are currently fielding teams for the Ragnar Adirondacks on September 25th and 26th. 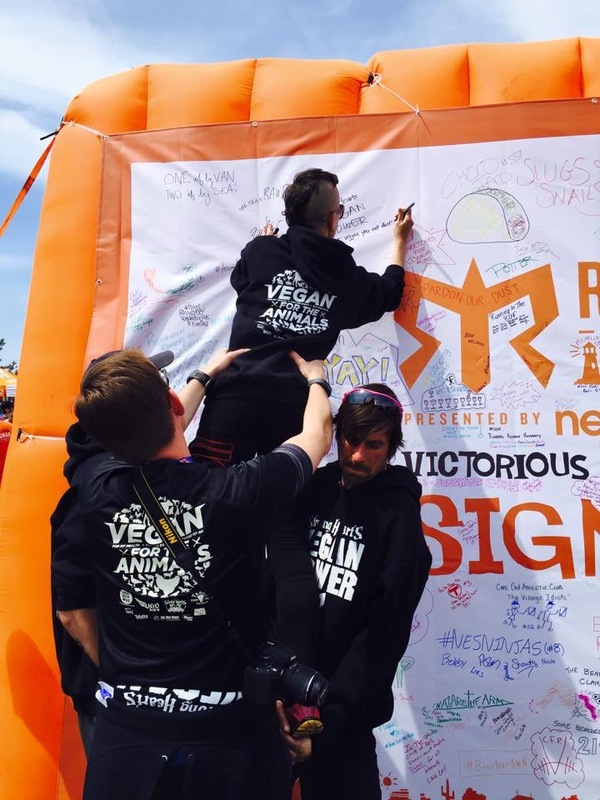 If you are a vegan runner who wants to be a part of something amazing, please get in touch! 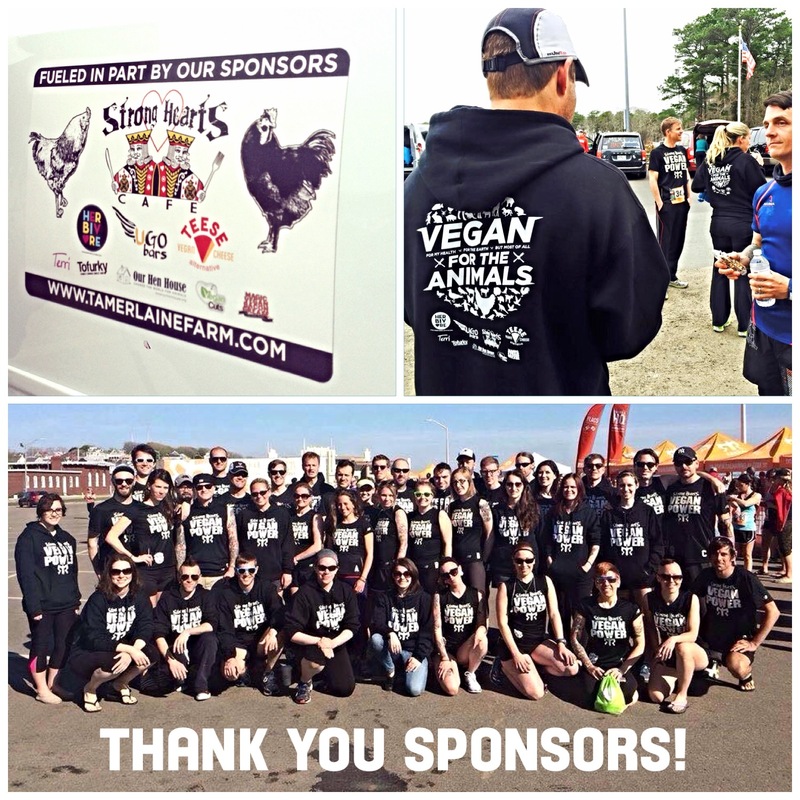 If you are a vegan who doesn’t love running, we’re going to need drivers too! We had 6 awesome drivers who were so inspired by this event – they will all be running the next one! Check out our website and our Facebook fan page to keep up-to-date with what we are doing! And last…check out this awesome video that Chris Cooney, of The Vegan Zombie fame, made during the last few hours of Team A Van 2’s race. STRONG HEARTS TO THE FRONT! This entry was posted in race, race report, Ragnar, Ragnar Cape Cod, Strong Hearts Vegan Power, Tamerlaine Farm and tagged Herbivore Clothing, Magic Vegan Bacon Grease, Our Hen House, race, race report, racing, Ragnar, Ragnar Cape Cod, Ragnar Cape Cod 2015, relay racing, running, Strong Hearts Cafe, Strong Hearts Vegan Power, Strongest Hearts, strongheartsrun, Tamerlaine Farm, Teese, Terri NYC, The Vegan Zombie, Tofurkey, UGO Bars, vegan, vegan athletes, Vegan Cuts, Vegan Power, vegan running, Whole Foods Hingham by lljkline. Bookmark the permalink. I didn’t know that Whole Foods donated that water!